Autophosphorylating histidine protein kinases are predominantly found in bacterial organisms and to a more limited extent in archaebacteria and nonvertebrate eukaryotic organisms where they function in two-component signal transduction pathways. These signaling systems typically consist of a sensor histidine kinase (HK) and a response regulator (RR) (Fig. 1A). HKs are responsive to extracellular stimuli and can undergo adenosine triphosphate (ATP)-dependent autophosphorylation of a conserved histidine residue. The phosphoryl group is then transferred to a conserved aspartic acid residue in the RR protein, which then acts as a molecular switch for activating an associated effector domain or triggering downstream signaling events. A large majority of RRs contain C-terminal effector domains that have DNA-binding activity and thus function in regulating gene expression. In some cases, expanded versions of the two-component system have evolved whereby additional response regulator domains and histidine-containing phosphotransfer (HPt) proteins have been incorporated, thus forming a multistep phosphorelay (Fig. 1B). It has been estimated that nearly 20% of all HKs are hybrid proteins that have a RR domain fused at the C-terminus . These additional signaling modules presumably allow for more regulatory checkpoints and flexibility of the signaling pathway. The importance of two-component regulatory systems is illustrated by the wide variety of essential cellular processes that are governed by HKs and RRs. In bacteria, for example, two-component systems regulate cell-cell communication, cell differentiation, pathogenesis, and adaptive responses to environmental stress. In plants, fungi, and slime molds, multistep histidine-to-aspartate phosphorelay systems play important regulatory roles in hormone signaling pathways, stress responses, virulence, cell-cycle progression, and cell differentiation. Our aim here is to provide an overview regarding the general functional properties and structural organization of histidine protein kinases. We also refer the interested reader to several recent review articles [1-6] and monographs [7,8] that more comprehensively cover the subject of HKs and their role in two-component signal transduction systems. A large majority of HKs are multidomain, membrane-bound proteins, which contain an N-terminal extracellular sensing domain and a cytoplasmic kinase domain. In contrast to many eukaryotic receptor tyrosine kinases that are induced to form dimers upon ligand binding, sensor HKs exist in a dimeric state within the bacterial inner membrane or plasma membrane of eukaryotic cells. The transmembrane signaling mechanism is proposed to involve a conforma-tional change that affects juxtaposition of the two monomers relative to each other, which in turn affects kinase or phos-photransfer activities of the HK. It should be noted that not all HKs are associated with membranes; rather, there are also soluble cytoplasmic HKs that lack transmembrane spanning regions but interact with membrane-bound, receptorlike proteins. ATP-dependent phosphorylation of the HK monomers occurs intermolecularly. Subsequently, the phos-phoryl group is transferred to a downstream RR. Some HKs have also been shown to exhibit phosphatase activity toward their cognate RR proteins. Thus, HKs can have at least three to four functional roles: sensory perception, autophosphory-lation, phosphoryl transfer, and RR phosphatase activity. The effect of external stimuli on HK function can be to alter the rate of autophosphorylation or affect the relative ratios between autokinase, phosphotransfer, and RR phosphatase activities. Regardless of the particular mode of HK regulation, the net result is a change in the level of phosphorylated RR in the cell and the output response is elicited. Figure 1 Two-component phosphotransfer systems. (A) Simple two-component phosphotransfer systems consist of a homodimeric membrane-bound sensor histidine kinase (shown here as a monomer) and a response regulator. The histidine kinase (with transmembrane segments indicated as TM1 and TM2) autophosphorylates on a conserved histidine (H) residue using ATP. The phosphoryl group (PO2-) is then transferred to a conserved aspartic acid (D) residue in the cognate response regulator. The output response of the signaling pathway is regulated by phosphorylation/dephosphorylation of the response regulator protein. (B) Multistep phosphorelay systems often consist of a hybrid HK that contains an additional response regulator domain at the C terminus and a histidine-containing phos-photransfer (HPt) protein that signals to a downstream response regulator protein. N-terminal membrane-spanning regions that effectively place a sensing domain outside the cell. As might be expected, the sequences of the sensing domains vary considerably, which is indicative of the wide variety of signals perceived by different HKs. Several conserved sequence motifs can be found within the cytoplasmic domains of HKs, and these are designated the H, N, G1, F, and G2 boxes [11,12]. The H box contains the phosphorylatable histidine residue, which is often found within the dimerization domain, whereas the N, G1, F, and G2 boxes are the hallmarks of the kinase domain and comprise the ATP-binding site. The linker region between the transmembrane domain and the cytoplasmic H box is predicted to form a coiled-coil structure consisting of two amphipathic helices (also known as a HAMP domain) . This region has been demonstrated to be critical for signal transmission and most likely affects intermolecular and/or domain-domain interactions [14-16]. Three-dimensional structure information is available for domains of two HK proteins, the bacterial osmosensor EnvZ and the bacterial chemotaxis protein CheA, and has revealed several similarities and differences among HK proteins [17-20]. The histidine kinase domain is structurally distinct from other kinases for which structural information is available. However, the histidine kinase domain resembles other proteins that catalyze ATP hydrolysis such as DNA topoiso-merase II, the chaperone Hsp90, and the DNA mismatch repair enzyme MutL [21,22]. Several structures are now available for full-length RR proteins and even activated RRs, but full-length HKs have posed significant problems for structural biologists due to their multidomain architecture and membrane localization . Chemically, phosphorylated histidines are one of the least stable of the known phosphoamino acids. Phosphorylation of the histidine residue in HKs results in the formation of a high-energy phosphoramidate (N-P) bond. In contrast, phosphorylation of hydroxyamino acids such as serine, thre-onine, and tyrosine results in formation of relatively stable phosphoester (O-P) bonds. The large standard free energy of hydrolysis of the N-P bond helps to explain why phos-phohistidine-containing proteins are ideal as phosphodonors in two-component signaling pathways, bacterial sugar-phosphate transport systems, and as phosphoenzyme intermediates [6,23,24]. Phosphorylation of the aspartic acid residues in response regulators also produces a high-energy acyl phosphate linkage, and it has been proposed that this energy is used to drive long-range conformational changes in proteins . Overall, HKs function to modulate the level of phospho-rylation of their cognate RRs in response to environmental stimuli; therefore, a discussion of HKs would be incomplete without at least a brief description of RRs. Most RRs have a two-domain architecture in which an N-terminal regulatory domain controls the activity of a C-terminal effector domain in a phosphorylation-dependent manner. The majority of bacterial RRs have effector domains that specifically bind DNA and, therefore, function to activate or repress gene transcription. These can be further divided into OmpR, NarL, NtrC, and LytTR subfamilies based on phylogenetic relatedness of the DNA-binding domain [26-28]. Other RRs have effector domains with enzymatic activity—for example, the methylesterase CheB  and the cAMP-dependent phosphodiesterase RegA . Some RRs, like the chemotaxis protein CheY, do not have an effector domain but rather signal to downstream effector proteins via protein-protein interactions. Extensive biochemical and structural characterization of RR proteins have revealed some general features and functional properties of the conserved regulatory domain (also referred to as a receiver domain) . These domains consist of about 125 amino acid residues and have a common doubly wound p5a5 tertiary fold that supports an active site composed of several highly conserved carboxylate-containing side chains and an invariant lysine. The regulatory domain catalyzes phosphoryl group transfer from the phosphohis-tidyl residue of the cognate HK (or HPt protein) to a conserved aspartyl side chain within the active site of the RR in a Mg2+-dependent manner. RR proteins most likely exist in a dynamic equilibrium between two (or possibly more) con-formational states, and phosphorylation is thought to affect this equilibrium by promoting or stabilizing one particular conformation, the activated state. In some cases, such as CheB and PhoB, phosphorylation of the RR relieves inhibitory interactions between the regulatory and effector domains [31,32]. For other RRs, phosphorylation serves to increase the affinity of the RR for DNA, promote RR dimerization, or affect downstream protein-protein interactions. The phos-phorylated lifetimes of RRs can vary substantially from one another, often reflecting the duration of the cellular response. RRs have an intrinsic (or self-catalyzed) phosphate hydrolysis rate, which in some cases can be influenced by auxiliary protein phosphatases. In addition, some RRs are subject to HK-catalyzed dephosphorylation. Although HKs and RRs have been studied extensively and some two-component systems are well understood at the biochemical and structural levels, there are many unanswered questions in the field. For example, what is the mechanism of transmembrane signal transmission? How are different HKs regulated? How are signals transmitted and processed within individual two-component signaling systems? How do cognate HK and RR pairs interact with each other? These questions will undoubtedly be answered through combinatorial and interdisciplinary approaches. Given the vast number of critical processes that two-component signaling pathways control in the cell, HKs and RRs will continue to be a popular subject of many investigators in the years to come. 1. Grebe, T. W. and Stock, J. B. (1999). The histidine protein kinase super-family. Adv. Micro. Physiol. 41, 139-227. 2. Hoch, J. A. (2000). Two-component and phosphorelay signal transduc-tion. Curr. Opin. Microbiol. 3, 165-170. 3. Stock, A. M., Robinson, V. L., and Goudreau, P. N. (2000). Two-component signal transduction. Annu. Rev. Biochem. 69, 183-215. 4. West, A. H. and Stock, A. M. (2001). 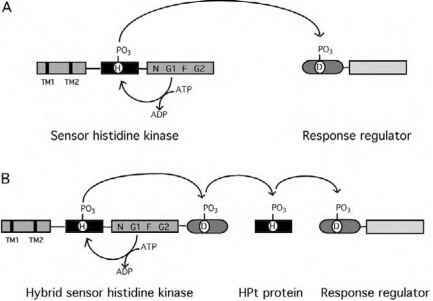 Histidine kinases and response regulator proteins in two-component signaling systems. Trends Biochem. Sci. 26, 369-376. 5. Saito, H. (2001). Histidine phosphorylation and two-component signaling in eukaryotic cells. Chem. Rev. 101, 2497-2509. 6. Klumpp, S. and Krieglstein, J. (2002). Phosphorylation and dephos-phorylation of histidine residues in proteins. Eur. J. Biochem. 269, 1067-1071. 7. Hoch, J. A. and Silhavy, T. J., eds. (1995). Two-Component Signal Transduction. American Society for Microbiology Press, Washington, D.C.
8. Inouye, M. and Dutta, R. (2003). Histidine Kinases in Signal Transduction, Academic Press, San Diego. 9. Pao, G. M. and Saier, Jr., M. H. (1997). Nonplastid eukaryotic response regulators have a monophyletic origin and evolved from their bacterial precursors in parallel with their cognate sensor kinases. J. Mol. Evol. 44, 605-613. 10. Koretke, K. K., Lupas, A. N., Warren, P. V., Rosenberg, M., and Brown, J. R. (2000). Evolution of two-component signal transduction. Mol. Biol. Evol. 17, 1956-1970. 11. Parkinson, J. S. and Kofoid, E. C. (1992). Communication modules in bacterial signaling proteins. Annu. Rev. Genet. 26, 71-112. 12. Swanson, R. V., Alex, L. A., and Simon, M. I. (1994). 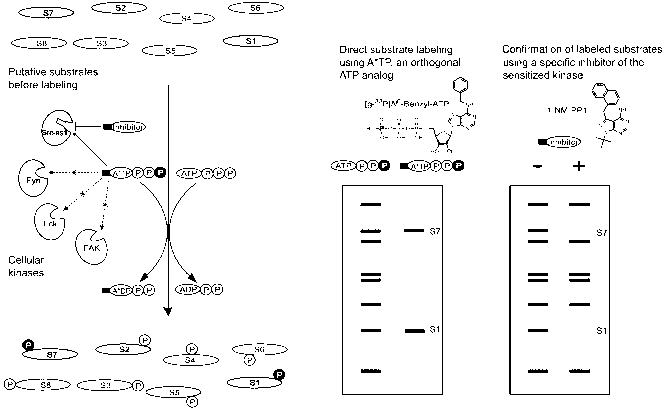 Histidine and aspartate phosphorylation: two-component systems and the limits of homology. Trends Biochem. Sci. 19, 485-490. 13. Singh, M., Berger, B., Kim, P. S., Berger, J. M., and Cochran, A. G. (1998). Computational learning reveals coiled-coil-like motifs in histidine kinase linker domains. Proc. Natl. Acad. Sci. USA 95, 2738-2743. 14. Williams, S. B. and Stewart, V. (1999). Functional similarities among two-component sensors and methyl-accepting chemotaxis proteins suggest a role for linker region amphipathic helices in transmembrane signal transduction. Mol. Microbiol. 33, 1093-1102. 15. Tao, W., Malone, C. L., Ault, A. D., Deschenes, R. J., and Fassler, J. S. (2002). A cytoplasmic coiled-coil domain is required for histidine kinase activity of the yeast osmosensor, SLN1. Mol. Microbiol. 43, 459-473. 16. Aravind, L. and Ponting, C. P. (1999). The cytoplasmic helical linker domain of receptor histidine kinase and methyl-accepting proteins is common to many prokaryotic signaling proteins. FEMS Microbiol. Lett. 176, 111-116. 17. Mourey, L., Da Re, S., Pédelacq, J.-D., Tolstykh, T., Faurie, C., Guillet, V., Stock, J. B., and Samama, J.-P. (2001). Crystal structure of the CheA histidine phosphotransfer domain that mediates response regulator phosphorylation in bacterial chemotaxis. J. Biol. Chem. 276, 31074-31082. 18. Bilwes, A. M., Alex, L. A., Crane, B. R., and Simon, M. I. (1999). Structure of CheA, a signal-transducing histidine kinase. Cell 96, 131-141. 19. Tanaka, T., Saha, S. K., Tomomori, C., Ishima, R., Liu, D., Tong, K. I., Park, H., Dutta, R., Qin, L., Swindells, M. B., Yamazaki, T., Ono, A. M., Kainosho, M., Inouye, M., and Ikura, M. (1998). NMR structure of the histidine kinase domain of the E. coli osmosensor EnvZ. Nature 396, 88-92. 20. Tomomori, C., Tanaka, T., Dutta, R., Park, H., Saha, S. K., Zhu, Y., Ishima, R., Liu, D., Tong, K. I., Kurokawa, H., Qian, H., Inouye, M., and Ikura, M. (1999). Solution structure of the homodimeric core domain of Escherichia coli histidine kinase EnvZ. Nat. Struct. Biol. 6, 729-734. 21. Stock, J. (1999). Signal transduction: gyrating protein kinases. Curr. Biol. 9, R364-R367. 22. Dutta, R. and Inouye, M. (2000). GHKL, an emergent ATPase/kinase superfamily. Trends Biochem. Sci. 25, 24-28. 23. Tan, E., Besant, P. G., and Attwood, P. V. (2002). Mammalian histidine kinases: do they REALLY exist? Biochemistry 41, 3843-3851. 24. Robinson, V. L. and Stock, A. M. (1999). High energy exchange: proteins that make or break phosphoramidate bonds. Structure 7, R47-R53. 25. Jencks, W. P. (1980). The utilization of binding energy in coupled vectorial processes. Adv. Enzymol. 51, 75-106. 26. Mizuno, T. (1997). Compilation of all genes encoding two-component phosphotransfer signal transducers in the genome of Escherichia coli. DNA Res. 4, 161-168. 27. Pao, G. M. and Saier, Jr., M. H. (1995). Response regulators of bacterial signal transduction systems: selective domain shuffling during evolution. J. Mol. Evol. 40, 136-154. 28. Nikolskaya, A. N. and Galperin, M. Y. (2002). A novel type of conserved DNA-binding domain in the transcriptional regulators of the AlgR/AgrA/LytR family. Nucl. Acids Res. 30, 2453-2459. 29. Stock, J. B. and Koshland, Jr., D. E. (1978). A protein methylesterase involved in bacterial sensing. Proc. Natl. Acad. Sci. USA 75, 3659-3663. 30. Thomason, P. A., Traynor, D., Stock, J. B., and Kay, R. R. (1999). The RdeA-RegA system, a eukaryotic phospho-relay controlling cAMP breakdown. J. Biol. Chem. 274, 27379-27384. 31. Djordjevic, S., Goudreau, P. N., Xu, Q., Stock, A. M., and West, A. H. (1998). Structural basis for methylesterase CheB regulation by a phos-phorylation-activated domain. Proc. Natl. Acad. Sci. USA 95, 1381-1386. 32. Ellison, D. W. and McCleary, W. R. (2000). The unphosphorylated receiver domain of PhoB silences the activity of its output domain. J. Bacteriol. 182, 6592-6597.